New research focused on the mechanisms and rates of how snow and ice is lost to the ocean from the land, along with studies of past climates offer new insights into how much sea level may change in the coming years. Earth’s rapid warming since the 19th century offers a unique challenge to the research community in projecting the extent of sea level rise (SLR) by 2100 and beyond. Two research avenues – one based on satellite and ground observations and the other on paleoclimate reconstructions of the past – offer new insights. Both approaches utilize computer models to further explore the relationship between sea level and climate. The stakes are high for coastal and island settlements around the world. 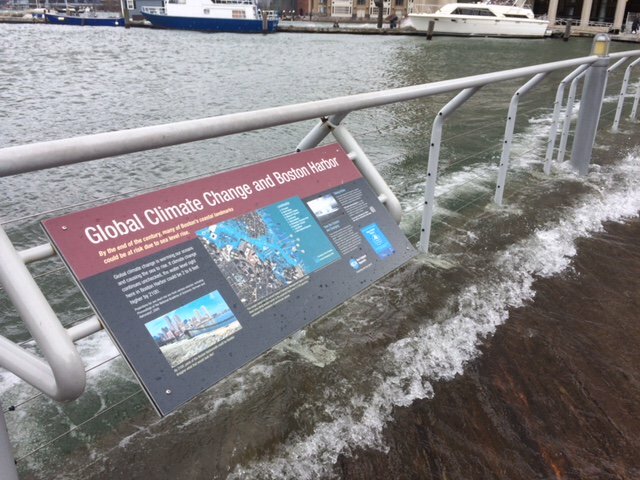 Sea level rise meets storm surge and spills over the Boston Harborwalk. Image via New England Aquarium. After the depth of the last Ice Age some 20,000-22,000 years ago when much of North America was buried in ice, the Earth began to warm and with that warming sea level began to rise. The deglaciation lasted from about 19,000-8,000 years ago. During this time sea level rose both gradually and in fits and starts. One notable example of rapid sea level change, Meltwater Pulse 1A, occurred about 14,000 years ago. During this interval of rapid SLR, ocean levels rose an estimated 16 to 25 meters over about 500 years. This event averaged 30 to 60 millimeters (mm) per year (Cronin 2012, Golledge 2014), some 10 to 20 times faster than current rates. A paper by Nerem et al (2018) based in part on satellite data (Topex Poseidon and Jason 1, 2, 3) shows that the SLR rate since 1993 is now about 3 ± 0.4 mm per year. Meltwater Pulse 1A occurred when massive amounts of land ice were undergoing rapid melting. What drove the melting involved different factors than today (warming in past interglacial periods was due primarily to orbital variation versus warming now driven directly by greenhouse gases and land use change). As such, a meltwater pulse from the past does not provide a perfect analog for what rates may occur with extended global warming during this century and hundreds of years to come. However, these paleo studies offer important clues as to what maximum rates and extent of SLR could be. Before human-caused climate change, the rate of sea level change during the last 6,000-7,000 years was very gradual – reflecting the relatively stable climate of the Holocene. During this time agriculture and civilization flourished. Over the last several thousand years SLR is estimated to have been near zero to 0.2 mm per year. That rate began to increase during the pre-industrial to industrial transition due to an acceleration of meltwaters entering the ocean from mountain glaciers and land ice combined with the expansion of water as it warms. During the 20th century, coincident with global warming of about 0.6°C, the average rate of SLR is estimated to have increased to 1.7 ± 0.05 mm per year over the relatively flat rate of the recent Holocene. Toward the last quarter of the 20th century the rate continued to rise. Satellite measurements begun in 1979 provide data to help understand the extent of mass loss from land ice and provide inputs into estimates of the present SLR rate, now at 3 ± 0.4 mm per year. If this rate were to continue to the end of the 21st century, sea level would be about 65 centimeters greater than today. However, research indicates that the rate is accelerating at about 0.084 ± 0.025 mm/y2,roughly doubling total SLR to more than 1 m by the end of the century (Nerem et al 2018). Currently, the global average temperature is about 1°C higher than pre-industrial and may exceed the international Paris Accord goal of 2°C. If the Earth stays at these elevated temperatures for long periods of time, it becomes critical to understand when past temperatures were similar, and the resulting estimates of sea level.Before the last Ice Age, several interglacial periods had either a similar temperature or carbon dioxide (CO2) concentration to what we are now experiencing, or will experience in the coming decades. 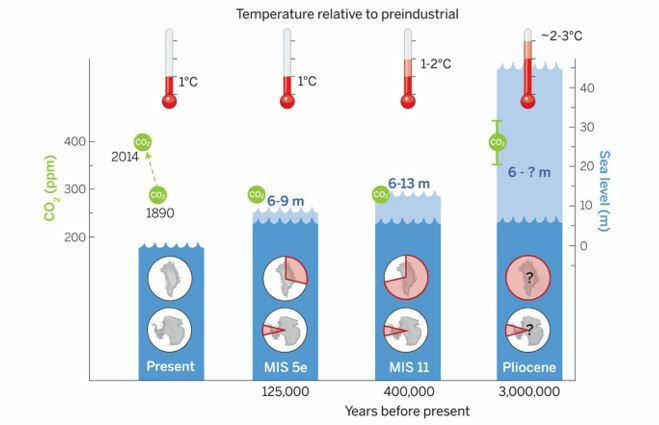 The two interglacial periods most like present occurred 125,000 and 400,000 years ago (MIS 5e and MIS 11) with peak sea level of 6 to 9 m and 6 to 13 m higher than pre-industrial levels respectively (the middle two bar graphs below, Dutton 2015). Going back 3 million years (the bar on right below) temperatures are estimated to be 2 to 3°C warmer than pre-industrial temperatures with CO2 concentrations similar to today at ~ 400 parts per million. This climate of the Pliocene is estimated to have had sea level greater than today’s by 6 m.
Present CO2 and sea levels compared to preindustrial levels. Green indicates the concentration of CO2 in ppm, red the estimated temperatures with the range indicated. The pink shading in the circles over Greenland and Antarctic show the relative contribution of each land mass ice to sea level. The dark to light blue shading indicates the range in estimated sea level. Even if we achieve peak and then sustained a decline in CO2 emissions, consistent with the Intergovernmental Panel on Climate Change (IPCC) low-emission scenario, sea level will continue to rise for centuries. The IPCC Special Report on 1.5°C states the estimated sea level difference between a 1.5 versus a 2°C path by 2100 is 0.26–0.77 m and 0.35–0.93 m respectively (IPCC SR1.5). Further complicating the ability to project SLR is the uncertainty in how to fully model and project major instabilities that could trigger more rapid melt pulses. For example, a rapid rise could be triggered by instabilities in the West Antarctic Ice Sheet. During the satellite record, altimeter based ice mass studies have revealed an increasing mass loss by decade for Antarctica as a whole (Rignot et al 2019). Better understanding the mechanisms and rates of SLR is an active area of research combining studies of the past with present measurements and models. If global temperatures continue to climb before stabilizing, the past indicates that sea level will eventually be significantly higher than today or consensus estimates for 2100, thereby dramatically altering continental coastlines suitable for settlement. Cronin, T. M. (2012). “Rapid sea-level rise.” Quaternary Science Reviews 56(11-30). Golledge, N. R., et al. (2014). “Antarctic contribution to meltwater pulse 1A from reduced Southern Ocean overturning.” Nature Communications 5: 5107. Nerem, R. S., et al. (2018). “Climate-change–driven accelerated sea-level rise detected in the altimeter era.” Proceedings of the National Academy of Sciences 115(9): 2022-2025. Dutton, A., et al. (2015). “Sea-level rise due to polar ice-sheet mass loss during past warm periods.” Science 349(6244): aaa4019. IPCC (2018). 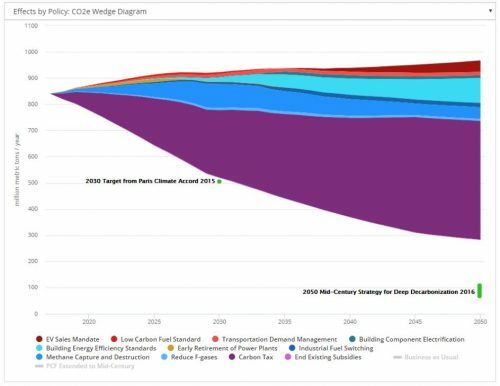 Global Warming of 1.5°C: Summary for Policymakers. Special Report, IPCC. Rignot, E., et al. (2019). “Four decades of Antarctic Ice Sheet mass balance from 1979–2017.” Proceedings of the National Academy of Sciences: 201812883.